ELLIJAY, Ga. – Reports are coming in after school today as a student began threatening Gilmer High School. According to confirmation from the Gilmer School System, a parent reported the threats to administrators who promptly contacted authorities. The Gilmer County Sheriff’s Office quickly investigated and arrested the individual. Additionally, the Sheriff’s Office will also have extra staff monitoring the High School on Wednesday, March 27. 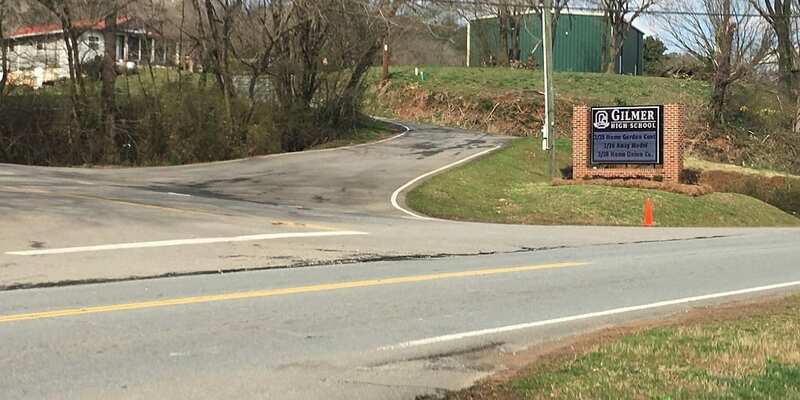 ELLIJAY, Ga. – Road repair on Bobcat Trail after a gas line break during road work is completed and both lanes are operational from Old 5, at the Civic Center, to Gilmer High School. Gilmer Schools Superintendent Dr. Shanna Downs has stated that the return to open traffic has appeared to be business as usual so far. With no reports of issues with the traffic or the road’s condition, it seems parents and students driving to school will soon return to the way things were before the storm damage and gas line break. 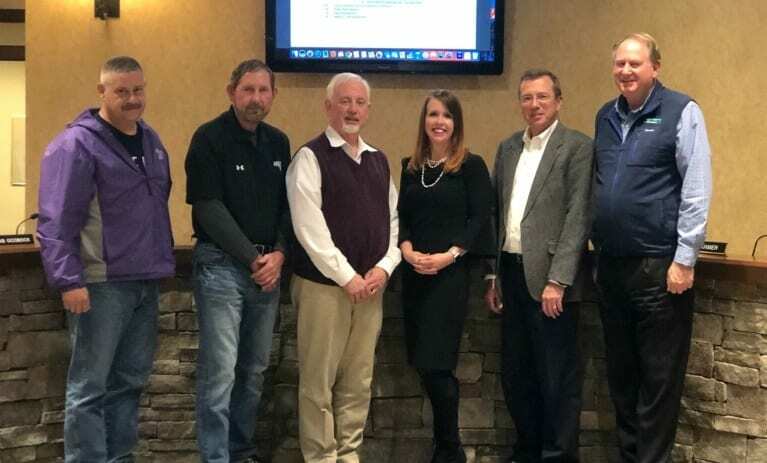 Next Article » Ellijay City Council Meeting - Monday, March 18, 2019. A 2-inch natural gas line was hit, causing a leak, during repairs on Bobcat Trail in March. 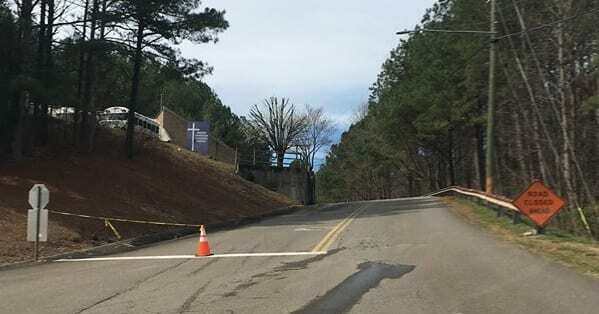 ELLIJAY, Ga. – Repairs on Bobcat Trail came to a halt Monday evening, March 4, as the contractor on the project struck a gas line hidden under the pavement. 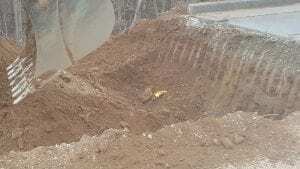 It appears that a backhoe struck the line when digging under the roadway and began leaking the gas as a section was torn out. According to an on-site Supervisor for DRS Contracting, an emergency locate had been called in. He further stated that an unnamed subcontractor for Atlanta Gas Light gave the “all-clear” for DRS to go ahead with the project. He asserted that Atlanta Gas Light’s report didn’t show any line in the area. 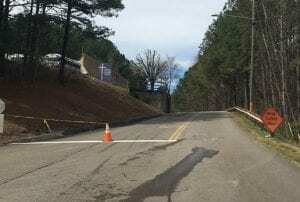 The line that was struck was four feet below the damaged roadway that was shut down by Gilmer County Charter School System last week. Work had just begun on repairing the damage today before hitting the line. While digging out under a section of road on Bobcat Trail, DSR Contracting struck the gas line. Emergency Servcies were immediately contacted as well as Atlanta Gas Light. The Ellijay Fire Department responded to the scene to monitor threats during repairs. Stay with FYN for updates on Bobcat Trail and the continuing repairs near Gilmer High School. 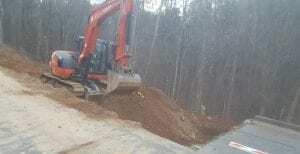 ELLIJAY, Ga. – Repairs are beginning today, March 4, on Bobcat trail at Gilmer High School. Arrival: All car riders will continue to be dropped off in the student parking lot. Please pull forward to the far set of stairs before circling through the parking lot to exit. When exiting Bobcat Trail towards Legion Road, all cars will be required to turn right at the stadium parking entrance. No cars will be permitted to go straight and exit behind Gilmer Middle School. Dismissal: For this week, ALL student drivers will be dismissed at 2:30, Car Riders will be dismissed at 2:45, and Bus Riders will be dismissed at the regular 3:20 dismissal time. Again, as cars exit Bobcat Trail, via Legion Road, all cars will be required to turn right at the stadium parking entrance, and no cars will be permitted to go straight and exit behind Gilmer Middle School. While current information points to the repairs being finished by week’s end, it is likely that parents and students will be able to access Bobcat Trail next week. However, no specific statements from the school have fully confirmed this yet. ELLIJAY, Ga. – Gilmer County High School is shutting down one of its two entrances to the high school. Bobcat Trail, the entrance across from the Gilmer Civic Center, has seen road damage recently. Parents/Guardians dropping off students will need to have students exit their cars at the base of the main stairs in the lower student parking. Drivers will then need to circle through the student parking lot in order to exit back onto Legion Road. No cars will be allowed beyond the Noah Harris Center between 7am-8:15am and 2:30pm-3:45pm. FYN currently understands that there is expected to be officers at Legion Road, just as they would be at Bobcat Trail, directing traffic onto Old Highway 5. No changes are needed in how student drivers enter and exit the school grounds. Student drivers will need to be extra cautious when driving and parking in the student parking lots due to the extra vehicles that will be coming through. These changes are to set to be in place for a few days at least, according to the Board of Education. Jasper, Ga – The Pickens County Board of Education hosted a no-threat lockdown today on the campus of Pickens High School. We currently have a team of deputies and K-9 units participating in a controlled sweep of the Pickens High School campus. While the school is being checked, students are being placed in a non-emergency lockdown status. Students are safe and no threat exists at the school. 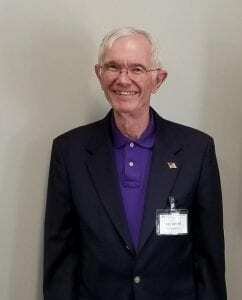 When questioned about the lockdown, Pickens County Schools Superintendent Dr. Carlton Wilson said the K-9 sweep was scheduled for a few weeks ago, but had to be pushed back due to scheduling conflicts with Cherokee County who supplies the K-9 units. As the Pickens County Sheriff’s Office has retired its last K-9 unit for medical reasons, Wilson stated it is a part of the agreement with Cherokee County to utilize theirs. With the lockdown and sweep completed, Wilson informed FYN that no drugs were located during the sweep today. 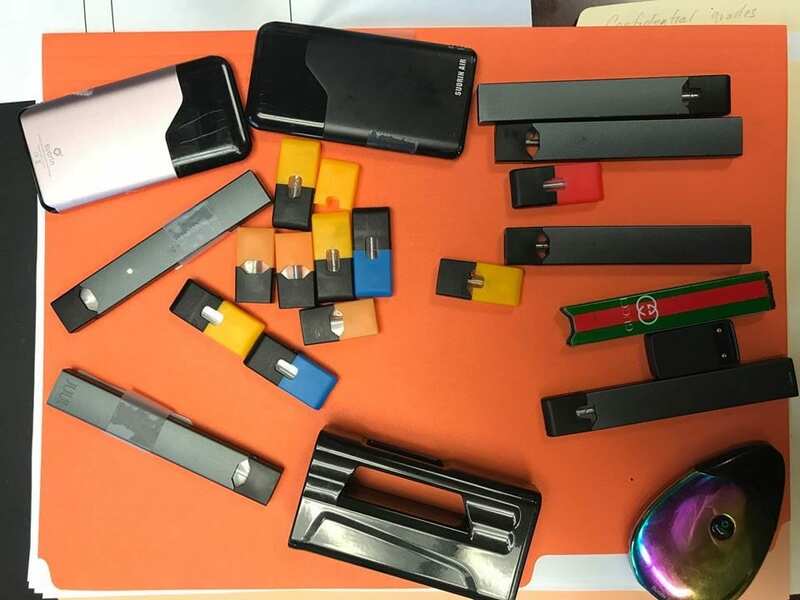 Though he noted it was not directly related to the rising use of vape devices, Wilson did respond to questions about the trend saying that it is a concern in the school system. More information on these steps like the K-9 sweeps and other programs the school already has in place over its years in operation can be found at the upcoming Monday, September 24, day of events involving the Office of the Sheriff, the District Attorney, and Pickens School district as they hold a meeting for parents for information and the ‘Chat with the Superintendent’ at Pickens High School at 6 p.m.
East Ellijay, Ga. – The Gilmer Christian Learning Center (CLC) opened the doors of its new addition at the Clear Creek Campus this week to dedicate the building and allow the public to see where students will be learning and growing in the coming years. The new campus adds on to the already well-established work being done at the High School campus located on Bobcat Trail between Gilmer High School and Gilmer Middle School. Executive Board Member, Loy Jarret spoke at Sunday’s Open House and Dedication of the Gilmer CLC’s new Clear Creek Campus. Jarret said the CLC exists to, among other things, teach kids about self-image, individual achievements, people skills, and spiritual foundation. As the mind, body, and soul make up a person, the soul stands most important. Accomplishing the 20-month long process, the building stands completed. With only interior items like landscaping, shelving, and supplies left to put the finishing touches in, CLC Director Jennifer Colson said the Gilmer CLC Clear Creek Campus will achieve its deadline to be ready for classes this fall. With students already lined up from last years class registrations, the building will begin seeing use in just a few weeks. 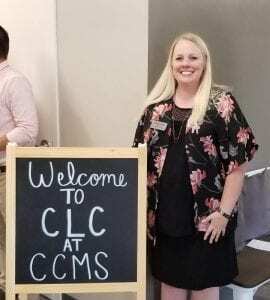 Jennifer Colson, Director of Gilmer’s Christian Learning Center, is set to split time at the two locations as she manages the program and its continued growth. With one 7th grade class and one 8th grade class, the cycle changes every 9 weeks to help reach as many students as possible. More than that, Colson says they are excited to have the new building in the Clear Creek campus and will be looking to host 6th, 7th, and 8th grades in the building as the system goes through changes to its schools’ restructuring in the coming years. s Director, Colson says she will be splitting her time between the two buildings in order to support the staff of the CLC’s two locations. Colson spoke at the Dedication Ceremony to offer thanks for those who donated, volunteered, and provided in every way for the new building. She also noted that the CLC program will be moving into the new building debt-free, an amazing feat as the CLC is a completely non-profit organization. Check out these photos and more from the ceremony and open house at FetchYourNews’ Facebook Page.